The MAG-LITE® ML125™ flashlight combines MAG-LITE® beauty, reliability and beam-adjustability with powerful new electronics, providing stunning brightness (193 LUMENS), long battery life and an array of user-configurable function sets. Designed for optimum light output, the new MAGLITE® ML125™ LED flashlight delivers performance oriented features in a sleeker compact design. This advanced lighting instrument is driven by next-generation MAG-LED® Technology. Now with more features...amazingly bright and engineered for long battery life. Runs on either an environmentally friendly NiMH Rechargeable Battery Pack OR (3) C-Cell Alkaline Batteries. 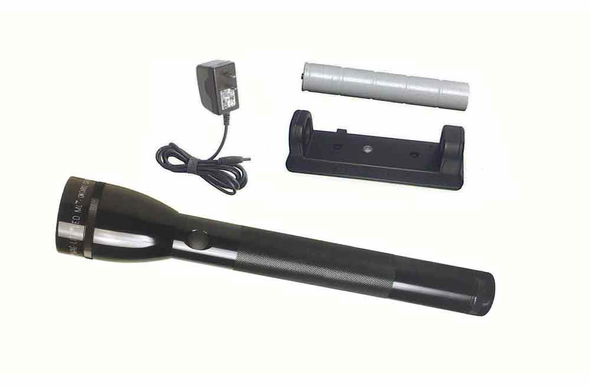 System includes: Maglite® ML125™ LED flashlight, NiMH Battery Pack, Portable Battery Charger, and AC Converter.